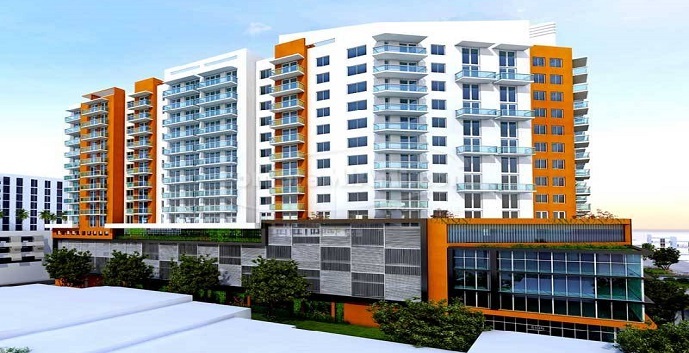 H3 at Hollywood Station by Team Real Estate Development is a new condominium located on Van Buren Street in Hollywood, close to downtown Hollywood, the Hollywood Broadwalk, nightlife, entertainment, and beaches. H3 at Hollywood amenities include a beautifully landscaped pool area and covered parking. A - 1 story, 1 bedroom, 2 baths, 822 square feet. Top features include a gourmet kitchen, living/dining room, den, and balcony. A1 - 1 story, 1 bedroom, 2 baths, 818 square feet. Top features include a gourmet kitchen, living/dining room, den, and private balcony. A2 - 1 story, 1 bedroom, 1 bath, 658 square feet. Top features include a gourmet kitchen, living/dining room, and private balcony. A3 - 1 story, 1 bedroom, 1 bath, 846 square feet. Top features include a gourmet kitchen, living/dining room, and private balcony. A4 - 1 story, 1 bedroom, 1 bath, 761 square feet. Top features include a gourmet kitchen, living/dining room, and private balcony. A5 - 1 story, 1 bedroom, 1 bath, 812 square feet. Top features include a gourmet kitchen, living/dining room, and private balcony. A6 - 1 story, 1 bedroom, 1 bath, 828 square feet. Top features include a gourmet kitchen, living/dining room, and private terrace. A7 - 1 story, 1 bedroom, 2 baths, 822 square feet. Top features include a gourmet kitchen, living/dining room, den, and private balcony. A8 - 1 story, 1 bedroom, 2 baths, 766 square feet. Top features include a gourmet kitchen, living/dining room, and private balcony. A9 - 1 story, 1 bedroom, 2 baths, 770 square feet. Top features include a gourmet kitchen, living/dining room, and private balcony. A10 - 1 story, 1 bedroom, 2 baths, 828 square feet. Top features include a gourmet kitchen, living/dining room, den, and private balcony. A11 - 1 story, 1 bedroom, 2 baths, 828 square feet. Top features include a gourmet kitchen, living/dining room, den, and private balcony. B - 1 story, 2 bedrooms, 2 baths, 1171 square feet. Top features include a gourmet kitchen, breakfast bar, living/dining room, and private balcony. B1 - 1 story, 2 bedrooms, 2 baths, 1158 square feet. Top features include a gourmet kitchen, living/dining room, and private balcony. B2 - 1 story, 2 bedrooms, 2 baths, 1204 square feet. Top features include a gourmet kitchen, living/dining room, and two balconies. B3 - 1 story, 2 bedrooms, 2 baths, 1088 square feet. Top features include a gourmet kitchen, living/dining room, den, and private balcony. B4 - 1 story, 2 bedrooms, 2 baths, 1162 square feet. Top features include a gourmet kitchen, living/dining room, and private balcony. Studio A - 1 story, 1 bedroom, 1 bath, 513 square feet. Top features include a gourmet kitchen, living/dining room, and private balcony. Studio B - 1 story, 1 bedroom, 1 bath, 643 square feet. Top features include gourmet kitchen, living/dining room, den, and private balcony. Studio C - 1 story, 1 bedroom, 1 bath, 641 square feet. Top features include a gourmet kitchen and private balcony. Studio D - 1 story, 1 bedroom, 1 bath, 919 square feet. Top features include a gourmet kitchen, living room, den, and two balconies. Loft A - 2 story, 1 bedroom, 2 baths, 957 square feet. Top features include a gourmet kitchen, living room, den, and private balcony. Loft B - 2 story, 2 bedrooms, 2 baths, 1405 square feet. Top features include a gourmet kitchen, living room, den, and private balcony. Loft B1 - 2 story, 3 bedrooms, 3 baths, 1344 square feet. Top features include a gourmet kitchen, living/dining room, and private balcony. Loft C - 2 story, 3 bedrooms, 3 baths, 1445 square feet. Top features include a gourmet kitchen, living/dining room, and private terrace. TH1 - 2 story, 2 bedrooms, 2 baths, 2247 square feet. Top features include a gourmet kitchen, living room, dining room, and private terrace. TH2 - 2 story, 3 bedrooms, 2 baths, 2220 square feet. Top features include a gourmet kitchen, living/dining room, and private terrace.